This coming weekend will be a first for me, I will be coaching some ladies on the basics of creative writing. I have never considered myself a teacher, but I have done a lot of training in my life. Of course it wasn't in writing, but I still know the basics of teaching someone how to do something. Yes, being a teacher in a classroom is a whole other thing, but this won't be in a class setting, it will be at a coffee shop. I am nervous about it. I hope I am doing the right thing. I really want to help new writers and pay forward what helped me. Originally when I came up with the idea for our group, HODRW, I didn't think I would be the one actually leading this group. I figured they would want someone with more experience, but I look at it this way, I can learn a few things, too. I know I will never stop learning. I think it's important to help others, I mean someone helped you, right?! You weren't born knowing whatever it is you do. Someone took the time to teach you, whether it was in school, or in a trade, or even an artistic talent. 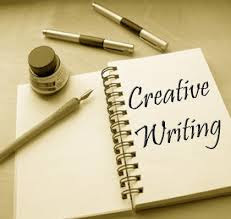 I just hope I am helpful and correctly teach the skills of creative writing. I am planning to do some research this week into workshops and see how they set up everything. Plus, I do have the knowledge of how my writing coach taught me and I have been applying some of that when working with my writer friend, Jodi. So, hopefully this will turn out to be a good thing. If you have any ideas for the structure I should use, please feel free to drop me a line. I am always open to hearing ideas. Keep your fingers crossed for me and next week I will fill you in on what I've come up with. Have a great week everyone! There's so much to creative writing it could take more than one weekend. The 5 elements of fiction (Plot, Setting, Character, Style, and Voice; or alternatively, Plot, Setting, Character, Style, and Theme). Some basic grammar (mostly the construction sentences; basic subject-predicate as well as the use of complex verb phrases and conjugations; and comma usage). I think those are the big baddies. Oh, and homonyms. That's another big one. Homonyms and contractions (of note, would've, should've, could've; I hate seeing would of, should of, could of-they make my eyes bleed). Genre structure. Genres are structured around those aforementioned 5 elements. The importance of the various elements depends on the genre. Fantasy and sci-fi focus on setting, romance on character, literary fiction on style and voice. Style pretty much needs its own lesson, since it has to cover tenses (simple past, simple present, simple future; past perfect, present perfect, and future perfect), points of view, etc. I'd probably include different lessons on setting and character and plot, as well. Oh, it will be an on going meet, hopefully twice a month. I agree this is not something that you can teach in a weekend. It will be basically a class, just not a classroom setting. Hopefully the group will grow and then we will move it to a library space so that we can continue helping new writers. That's the plan anyway! Thanks for the topics list, I could use any and all help and ideas! I meant conjunctions, not conjugations. Oops. Oh, and plurals. Apostrophes do not make plurals. It's the 1940s, not the 1940's (though it's the '90s -- and if using curly quotes, that should be an apostrophe/closing single quote and not an opening single quote). Writers not writer's. Apostrophe is possession, except in the cases of its, his, and hers. I think those are the only exceptions ... I could be mistaken. Susan might be able help out with that one. Passive voice and when to use it (i.e. when you want to place emphasis on the recipient of an action rather the actor, the actor is unknown or irrelevant, etc.). I do know the skills, what I was trying to do is find out the best way to lead the class. Should I just touch on a new subject each session, and then have them read their work out loud and we talk about it? Or should we trade pages of writing for critique too?! That is what I'm trying to figure out.